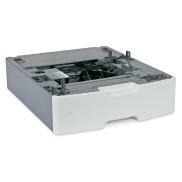 This drawer supports a range of narrow media not supported by the standard paper tray, with full envelope support. The Special Media Drawer enables you to feed quantities of custom-size media that range in 1 mm increments from 76.2 mm x 123.8 mm to 215.9 mm x 355.6 mm (3 in. x 4 7/8 in. to 8.5 in. x 14 in.). The minimum size supported in the drawer is 76.2 mm x 123.8 mm (3 x 4 7/8 inches) Paper (16 to 47 lb., 60 to 176 gsm), envelopes (16 to 28 lb, 60 to 105 gsm), labels, transparencies and card stock may be used from this drawer. Includes the 550-sheet tray. Paper (16 to 47 lb., 60 to 176 gsm), envelopes (16 to 28 lb, 60 to 105 gsm), labels, transparencies and card stock may be used from this drawer. Includes the 550-sheet tray. The Special Media Drawer enables you to feed quantities of custom-size media that range in 1 mm increments from 76.2 mm x 123.8 mm to 215.9 mm x 355.6 mm (3 in. x 4 7/8 in. to 8.5 in. x 14 in.). The minimum size supported in the drawer is 76.2 mm x 123.8 mm (3 x 4 7/8 inches). Paper size, paper and tray-present and tray-low sensing are supported. Size detection is enabled for A4, letter and legal paper as well as B6, C5 and #10 envelopes. Other standard sizes may be selected if automatic size detection is turned off. The optional caster base may be required when the product is configured with additional drawers or spacer and when used floor standing. Go to www.lexmark.com/multifunctionprinters for more information. The Universal size setting formats the page for 215.9 x 355.6 mm (8.5 x 14 in.) unless the size is specified by the software application.